Over the past decade, screenwriter Peter Morgan has focused so heavily on exploring the bonds and conflicts between pairs of people that the title of his 2010 HBO movie The Special Relationship could be considered a catch-all for his projects. Frost/Nixon, The Queen, The Last King Of Scotland, The Damned United, even the historical-romance adaptation The Other Boleyn Girl—each of them explores a historical figure through a key relationship, generally a political or professional association that comes to mean much more. The trend continues with Rush, written by Morgan and directed by his Frost/Nixon partner Ron Howard. This time around, the historical figures are Formula 1 drivers James Hunt and Niki Lauda, rivals on the track during a handful of keenly contested racing seasons in the mid-to-late 1970s. Morgan crafts their competition into an iconic clash between radically different approaches to the sport, and to the world in general: Hunt appears as a smirking adrenaline junkie who accessorizes his racing lifestyle with beautiful, disposable women and an endless supply of booze, while Lauda is a grimly ascetic, fun-hating cold fish who sees racing as a simple science. The real-life Lauda seems amused by his portrayal; he and the late Hunt were former roommates, old pals, and drinking buddies off the track, and he says he isn’t “as dull as they make it.” But real life isn’t nearly dramatic enough for Howard and Morgan, who initially frame the contest as a mano-a-mano showdown for the soul of racing. At least, until the roles get swapped. 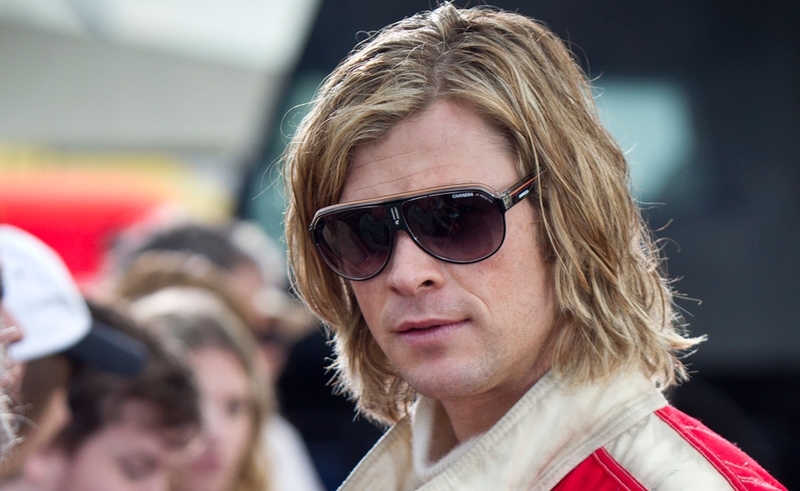 Thor star Chris Hemsworth plays Hunt as an easygoing, upbeat type, at least as long as he’s winning. He starts the film by narrating his own rise on the lower racing circuits, and framing Rush as if it’s largely his story: British up-and-comer made good. But as his initial races show, he’s primarily a success because of a daredevil recklessness bordering on irresponsibility. He’s perfectly willing to dangerously crowd other drivers on the track, then mock them as chickens if they cede ground; when he wins as a result, he justifies his heedless tactics with a smug shrug. Off the course, he lives just as impulsively—one early scene has him strolling into a hospital after being wounded by a man he was cuckolding. Within minutes, he and the nurse examining his injuries are enthusiastically examining a lot more of each other. But as with so many adult adolescents, his bad-boy swagger has a dark side. He’s immature in failure, and setbacks turn him into a stormy, selfish child. But he’s barely gotten his initial say in before Lauda (played by Good Bye, Lenin! star Daniel Brühl) takes over as narrator, setting up how the film will work as a whole, as a tug-of-war between points of view. When Lauda’s father, a wealthy Austrian industrialist, refuses to back his son’s racing career, Lauda secures a sizable loan and uses it as a crowbar to force his way into the industry, where he rapidly starts racking up wins he attributes to careful calculation and innate superiority. His arrogance is balanced by his superior knowledge: He’d rather be right than popular, but since he’s virtually always right, the teammates he offends with his curt dismissiveness tolerate him as best they can. Howard and Morgan stage all this setup with a leisurely character-building approach masked by go-go hyperkinetic energy. The heavily fictionalized story they build, about two polar opposites who come to see each other as kindred spirits, has relatively little do to with the details of the actual races, so Howard turns those into an impressionistic blur of shrieking engines and fast-cutting cameras. His jarring leaps from the racers’ faces to their tires—and often, in a tediously repeated gambit, to inside their cars’ engines—offer a sense of speed and power without any corresponding sense of a larger space. Until the film’s climax, the races are anonymous, interchangeable, and eventually repetitive. In passing, the film gets in a standard dig about “men who are willing to kill themselves driving in circles,” but Howard’s direction of the races suggests he does believe racing is boring and redundant, and only the final seconds count. And Rush comes mightily prepackaged, with pat, telling romantic arcs for both protagonists, and a summarizing conversation where they reveal what they’ve learned. Howard continues to have a weakness for broad character strokes and even broader symbolism, like celebrating a racer’s rise to fame with a montage set to David Bowie’s “Fame.” In a particularly by-the-book scene, a temporarily sidelined Hunt bellyaches about his need to get back to racing… while racing toy cars around an electric track. And when he gets bad news, one of the toy cars actually jumps the track. These kind of groaningly literal moments come too often, and give the impression of a story being spoon-fed to viewers one pre-chewed helping at a time. But Rush is still a tremendous thrill-ride, in part because it begins as a standard underdog story—Hunt as the good-time “party guy” setting out to unseat a hateful, superior enemy—and then flips the narrative, as a horrific setback turns Lauda into the clear underdog. Sports movies often follow such predictable courses that just identifying who a film identifies with normally means identifying the winner of the big game, but for those not familiar with the history involved, Rush’s changing sympathies keep the outcome in doubt, and stage the final contest breathlessly, while sticking to the facts. And Hemsworth and Brühl both offer memorable performances in characters who often aren’t likable, and sometimes aren’t believable, but are both mesmerizing in their emotional extremes, and their different styles of cocky confidence. Part of Rush’s appeal is its daring in presenting both men as flawed, problematic, and gradually maturing. It’s predictable in some ways, but not in all of them, and as the leads go around in their set circles, Howard and Morgan make the journey intense enough to keep audiences guessing up to the finish line.